Welcome to the Independence Day Blog Hop. We're a group of crafty blog friends making projects we like, using products we like, just for fun and inspiration!! Be sure to check out all the blogs on this hop for tons of crafty Independence Day Inspiration. Today I'm sharing a mixed media tag that I made. I started with a manilla tag and stamped one of my favorite background stamps by the Unity Stamp Company called Stars of Worn. I stamped the background in Tim Holtz Distress Inks - Faded Jeans and Barn Door. I also blended the edges of the card with the same distress inks. I cut the words out of the Tim Holts Kraft Core Seasonal Impressions Paper. The paper has lots of words on it and if you sand it the color comes off and you can see the words better. I cut out all the words and shapes and sanded them down to provide contrast to the images. I laid them out in sort of a subway art pattern to cover the tag. The star and the July 4th were also cut from the paper and glued together. 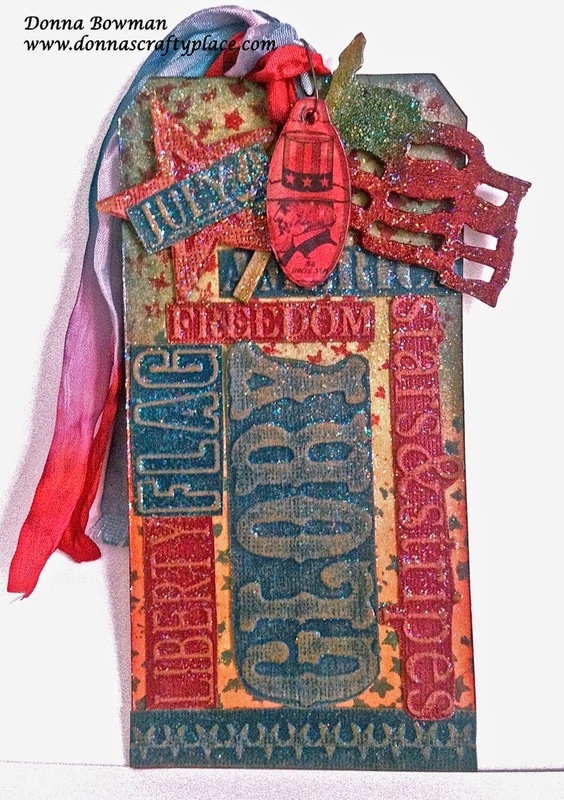 I die cut the flag from a Tim Holtz die and covered it with Distress Stains in Barn Door, Faded Jeans, and Metallic Gold. I dyed the Tim Holtz trim with Distress Stains in Barn Door and Faded Jeans, leaving a little white space in between the colors. I doubled up the trim before putting it on the tag. Finally, I thought it needed a little something else and my crafty friend Jenn Shurkus suggested glitter. So, I brushed the whole tag with Sparkle Modge Podge and it's just what it needed to add some interest. Then, at the last minute I remembered a technique I saw Tim Holtz do once in the old 12 Tags of Christmas to make little tag ornament. You can see him explain the technique here. I used a black and white image and I thought it stuck out like a sore thumb. But, since it was already adhered to the facet I had to think about how to add some color to it. I colored it with a Distress Marker in Barn Door, but it didn't work. Then I used Barn Door Distress Stain and it went through the paper and color it red. So, now I have a red Uncle Sam who fits better in the tag. I attached him to the ribbon with a Tim Holtz small paper clip. Thanks for stopping by and be sure to check out all the links below by finishing this hop for more Independence Day Projects and inspiration. You should have come here from Lynn K’s blog. Now go check out to Rachel K's blog. Cool tag Donna! Love all the techniques you used, especially the Sparkle Modge Podge - that was the icing on the cake!! Thanks so much for the invite to participate! Beautiful tag,great use of all the elements! WOW what a tag!!! So vintage...love!!! Fun tag, love the sparklies!! Beautiful tag! I love the texture! Great Tag love all the texture!